hydrating nutrition for beautiful skin. 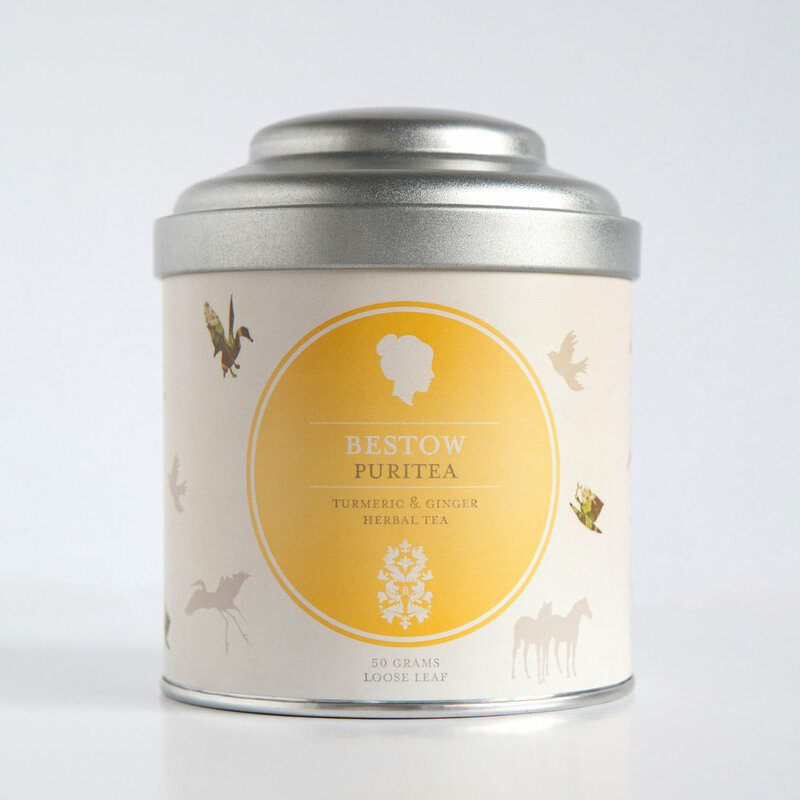 Bestow Organic Herbal Teas provide hydrating nutrition for beautiful skin. Our beautiful organic, loose-leaf herbal teas are the therapeutic alternative to coffee and black tea. While caffeine stresses and depletes your body, Bestow Organic Herbal Teas provide hydrating nutrition to support healthy, luminous, youthful skin. Flavour + Colour: Has a bright, yellow colour and mellow, earthy taste with subtle lemongrass zing. 100% rooibos, cinnamon, ginger, clove, nutmeg, cardamom and black pepper. Flavour + Colour: Has an earthy, red colour and rich flavour with aromatic spices. Ginger and clove are brilliant digestive aids. They also promote nutrient absorption, ensuring your body can take in the vitamins and minerals it needs for healthy skin. This tea supports beautiful skin by supporting beautiful digestion. That’s why this blend is called Beautea. 100% organic hibiscus and cinnamon. Flavour + Colour: Has a pretty pink colour and tangy flavour. Hibiscus contains more anti-oxidants than any other tea, which helps combat the ageing affects of free radicals on your skin. Flavour + Colour:Has a pale colour and gentle flavour. Flavour + Colour: Has a beautiful rose colour and gentle flavour. Beautifully crafted from glass and stainless steel. 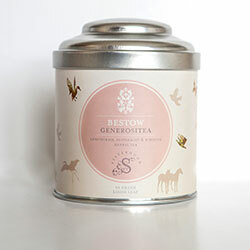 The perfect accessory to your Bestow Organic Herbal Tea Range. It will take pride of place on your bench top or table. Beautifully crafted from stainless steel. I used to be addicted to coffee. It was hard on my nervous system and I knew my body didn’t respond well to it. Giving up coffee was a gift I gave to my body and I have never looked back. I have since enjoyed exploring the colourful and therapeutic world of herbal teas. A simple tea-break can give you an extra boost of anti-oxidants, calm and relax you, cleanse the body or give you a burst of energy. It all depends which tea you choose. 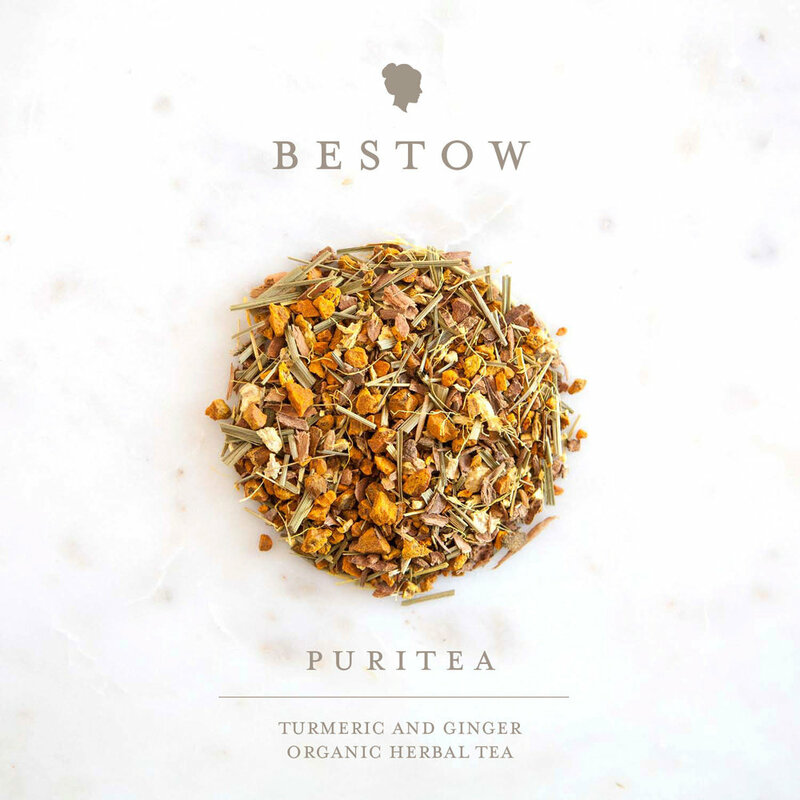 At Bestow, we gather to drink herbal tea together each morning and afternoon. We take turns making it, getting out our vintage china and serving tea on a silver tray. It is a beautiful ritual which gives us a joyful pause in our busy day. Nutritionally, it is a great opportunity to hydrate and get some added vitamins, minerals and phytonutrients. It was important to me to know that we were all drinking quality organic tea so that our skin and body received maximum goodness and none of the pesticides and chemicals that can creep into supermarket herbal teas. The best way to know what we were drinking was to develop our own range – so that’s exactly what we did. We were lucky enough to discover a Sri Lankan company with established organic tea plantations. The people there are even more passionate about tea than we are! The tea plantation is biodynamic and full of life with organic cattle providing compost, wild camphor in the hedgerows as a source of organic spray and the rich fragrance of tea leaves, basil and rosemary in the air. Put the kettle on / Select a beautiful tea-cup to enjoy your tea in / Steep your chosen Bestow Organic Tea in boiling water / While you wait for your tea to steep, take 5 slow, deep breaths / Put your hands on your belly and feel your belly rise and fall as you breathe all the way down / Sit quietly and sip your tea slowly, savouring this moment of blissful pause / Go onwards with grace and gratitude.